Information for staff that have been designated as an "Authorized User", with the ability to request a new VoIP line. New phones can be purchased through the DoIT Tech Store with a D number. The Cisco 7841 is the basic phone. The Jabra Headsets, Jabra 510 Speaker, and Cisco 8831 Conference phone, can also be purchased through the DoIT Tech Store. In order to request New/Change/Remove VoIP lines, Jabber Accounts, and new VoIP phones, you will need to submit a request through DoIT. The link below will have instructions on which type of request to submit. For users who need access to Cisco Jabber, you will need to submit a New Line Request. Note: Phone and Account configuration can take up to 2 weeks, from the day you submit a request. Once the request has been submitted and confirmation it has been completed, Shared Services IT can assist with setting up the phone. Send an email to Shared Services IT. Follow these instructions to install the software on your computer. 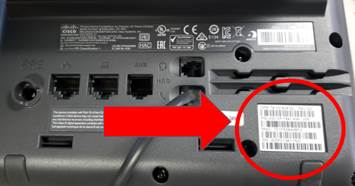 If you are submitting a request, and get asked for the MAC address of the phone, it can be found printed on a sticker located on the box of the phone, or on a sticker on the bottom of the phone. 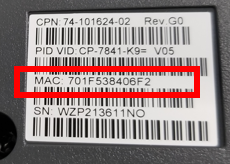 In the example picture below, the MAC address is 682C7B706696. In the example picture below, the MAC address is 701F538406F2. Data Jack numbers, should be labeled on the wall jack. 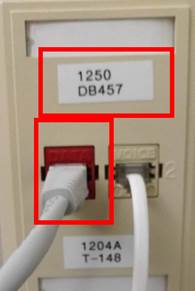 In the example picture below, the cable is plugged into (Data Jack # 1250-DB457) the Orange/Red input. Once the request has been submitted and confirmation it has been completed, Shared Services IT can assist with setting up the phone. Send an email to support@med.wisc.edu.